Have you read the story of Jonah? I wish I couldn’t relate to it, but I can. I know what it is to run from God’s will and be absolutely miserable until I obey. 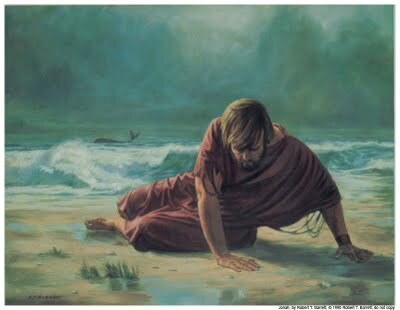 Thing is, when Jonah finally did get around to preaching repentance, his blues didn’t dissipate. He just sulked even more. Why? Because there wasn’t a true heart change. Whenever we do God’s will without God’s heart, we lose the plot. We can obey God all we want, but until we let him do the inner work, it just results in us feeling more self-righteous and more sorry for ourselves. If you’re running from God, please stop. It’s a total waste of time. But don’t stop there. Figure out why you’re running, and where you’re out of alignment with him. And then ask him to change you from the inside out so that you think, feel, and do as he does. Take a second and picture Jonah in the whale – it’s dark, smelly, and gross in there. He’s miserable. Now, imagine that instead of just caring for his own skin (“God, get me outta here!”), he asked God to help him care about the Ninevites, too. Can you envision how differently the story would have gone? Instead of grudgingly warning people to repent, Jonah would have willingly urged them to. Instead of sulking when they did, he would have rejoiced. If you want to be truly alive while doing God’s will, let him drill into your motives, attitudes, perspective, expectations, and agenda. And then ask him to replace what’s rotten with what’s good, so that you can obey joyfully for the right reasons instead of joylessly for the wrong ones.